A rapid and cost-effective lithographic method, polymer blend lithography (PBL), is reported to produce patterned self-assembled monolayers (SAM) on solid substrates featuring two or three different chemical functionalities. For the pattern generation we use the phase separation of two immiscible polymers in a blend solution during a spin-coating process. By controlling the spin-coating parameters and conditions, including the ambient atmosphere (humidity), the molar mass of the polystyrene (PS) and poly(methyl methacrylate) (PMMA), and the mass ratio between the two polymers in the blend solution, the formation of a purely lateral morphology (PS islands standing on the substrate while isolated in the PMMA matrix) can be reproducibly induced. Either of the formed phases (PS or PMMA) can be selectively dissolved afterwards, and the remaining phase can be used as a lift-off mask for the formation of a nanopatterned functional silane monolayer. 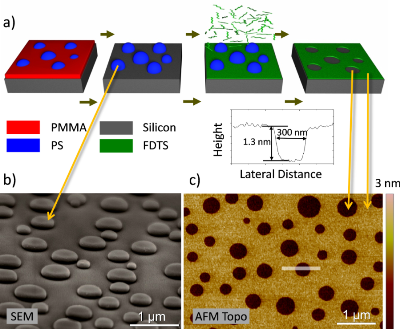 This “monolayer copy” of the polymer phase morphology has a topographic contrast of about 1.3 nm. A demonstration of tuning of the PS island diameter is given by changing the molar mass of PS. Moreover, polymer blend lithography can provide the possibility of fabricating a surface with three different chemical components: This is demonstrated by inducing breath figures (evaporated condensed entity) at higher humidity during the spin-coating process. Here we demonstrate the formation of a lateral pattern consisting of regions covered with 1H,1H,2H,2H-perfluorodecyltrichlorosilane (FDTS) and (3-aminopropyl)triethoxysilane (APTES), and at the same time featuring regions of bare SiOx. The patterning process could be applied even on meter-sized substrates with various functional SAM molecules, making this process suitable for the rapid preparation of quasi two-dimensional nanopatterned functional substrates, e.g., for the template-controlled growth of ZnO nanostructures .